For the past four years, I’ve been a part of the group that selects and publishes the We’re the People Summer Reading List. This year, we’re implementing changes to extend our reach. 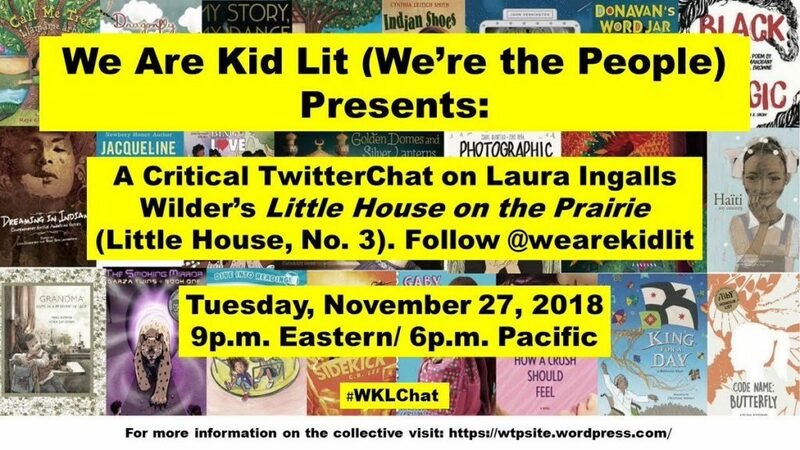 One thing we’ve done is change our name to We Are Kidlit in order to take an available hashtag on Twitter, as We’re the People was already taken. Our hashtag is now #WeAreKidLit, and we are sponsoring regular Twitter chats as part of our expanded mission at #WKLChat. You may follow the group @wearekidlit. Our first Twitter chat will take place on Tuesday, November 27 at 9 pm Eastern Time/6 pm Pacific Time. 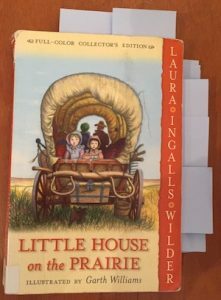 It will focus on Laura Ingalls Wilder’s classic Little House on the Prairie, volume 3 in the Little House series. 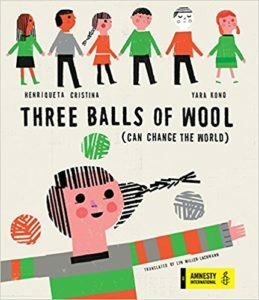 Moderating the chat will be this year’s We Are Kidlit members: Edi Campbell, Debbie Reese, Laura Jimenez, Sonia Alejandra Rodriguez, Sujei Lugo, Tad Andracki, and me. The purpose of the Twitter chat is a critical reading of this canonical work. We will explore the contexts in which it is used and the messages, overt and subliminal, that the novel communicates through both text and illustration. Among the perspectives we’ll use to discuss aspects of the book are ones of colonization (the settlers’ right to dominate land and animals, the idea that the prairie was empty: “Only Indians lived there.”), feminism (strict roles for men and boys, women and girls), race (the way text and illustrations racialize and dehumanize Indians, who are equated to wild animals), visual literacy, and cultural studies. We hope that the chat will give participants a more nuanced view of this novel as well as a broader context for discussing it. I finished rereading my library copy (here with post-its marking key passages and illustrations that I will have to spend time removing before I return the book) and the ending made me think of another novel I was forced to read in high school (along with a field trip to see the movie) and which appears on lists of writers’ key influences, Gone With the Wind. In both novels, a government action is portrayed as unfair, ending a noble way of life. In Wilder’s book, the beautiful little house that Pa built, the plow, and all his work seeding his land is for naught when the government forces him to move from Indian Territory, while in Gone With the Wind the “cultured” plantation society is supposedly destroyed at the end of the Civil War with the arrival of Federal troops. We’re supposed to cry over these acts and see the government as the oppressors of hardworking and deserving white people. After reading Little House on the Prairie, it was no surprise to find out, after a bit of research, that Wilder’s daughter and sole surviving child, Rose Wilder Lane, was an associate of Ayn Rand and a leading proponent of libertarian ideology in the mid-20th century. I hope you can attend the Twitter chat at #WeAreKidLit #WKLChat and look forward to the discussion. I know that for many people, this is a revered story. If you asked me to say anything positive about Little House on the Prairie, I would talk about the way Wilder describes the construction of the house and furniture, which I found fascinating. I wish I could describe the design and building of one of my Lego MOCs with the same clarity and economy of language. But part of bending the arc toward social justice involves looking critically at perspectives from the past and not accepting them at face value, going beyond saying “well, they were a product of their time” to showing specifically what the problems are and why we need a different lens today. How did the chat go, Lyn? Hope you have a great Thanksgiving? Thank you! The chat isn’t until next Tuesday, November 27. Hope you can join us! In any case, I hope you have a Happy Thanksgiving!